I’m leaving on Saturday morning for 5 days in beautiful Cancun. I’m joining my girlhood friend, Wendy, and 17 of her family and friends for a vacation of relaxing fun at the 5 star resort, Iberostar Tucan. This is my first resort vacation ever (with the exception of Walt Disney World with the kids) and I’ve been told this one is like a cruise on land. It’s all inclusive, meaning all the food and alcohol I can consume. I’m sure they will be sorry they ever extended that option to me!! Like I’m going to get my money’s worth on that? NOT!! But I will get my money’s worth on relaxing and walking on the beach and shopping and most of all, enjoying spending time with Wendy and her gang. As soon as I get home from Cancun, I turn right around the next morning and head to Oklahoma. I’m getting in one last visit with the Holsinger clan before they move to Alaska this summer. I haven’t seen them since December, and Steven, especially, has grown leaps and bounds in 5 months, plus he had his eye surgery since then, so I’m sure will look different. We’ll celebrate Megan’s 6th birthday and Mother’s Day while I am there. By the way, Robin told me yesterday that she and Ken found and bought a piece of property in Eagle River (where Ken’s parents live just outside Anchorage) and they will build their custom home there. More on that in future posts. On the one night I am home between trips, Alice is in town and will spend the night with me. We’ll have just an evening and breakfast together for me to catch up on her new granddaughter, Kinsley, born in March. Nathan spent the night last night, and today before I took him home, we stopped by Mom’s place. He got a ride on her scooter as we went outside to look for the rabbits that live there (didn’t find them), the bird’s nest (did find that) and all the pretty flowers. Pictures are posted on the gallery. Jan and I went out last night with Glenda and her family to help celebrate Glenda’s birthday. We all chipped in and got her a Tivo with a 3 month subscription. She was delighted, and I’m going to go over this weekend and help her set it up. We had a wonderful time and great filet minion at Stuart Anderson’s Black Angus. Check out new photos on my gallery. NBA playoffs start Sunday. Boy, have those Suns been fun to watch this season. It feels like we have the best chance at a championship this year that we have ever had. But after watching the Wildcats year after year, I am the first one to know and acknowledge that anything can happen! I’ll just be rooting for my team, and hoping each game that they play at least a tiny bit better and score at least one more point than the team they are playing against at any given time. I read an article this morning about umbilical cord blood. It was especially interesting to me because of Lauren’s cord blood stem cell transplant. Donating cord blood is such an easy thing to do — it doesn’t cost the donor a thing. Stem cells found in cord blood can treat or reverse a myriad of diseases and disorders, and it’s readily available — about 4 million cords a year pop out right here in the United States. I hope expectant mothers will become more aware of this option, and donating cords will become the standard process following birth. By the way, I’m registered to be a bone marrow donor. There was a recent drive while Lauren was at UA, and it seemed like the right thing to do. 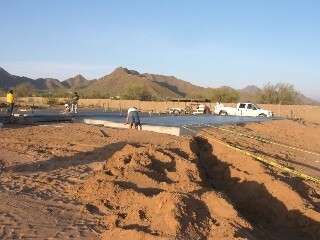 Brian and Carrie broke ground on their new home southeast of the Valley in Queen Creek. It’s a beautiful area just at the base of a small mountain range. It’ll be a long drive into town for Brian every day once they move, but the view can’t be beat. Brian has started posting some pictures of construction at the site on my gallery webpage, so check out the latest pics now.